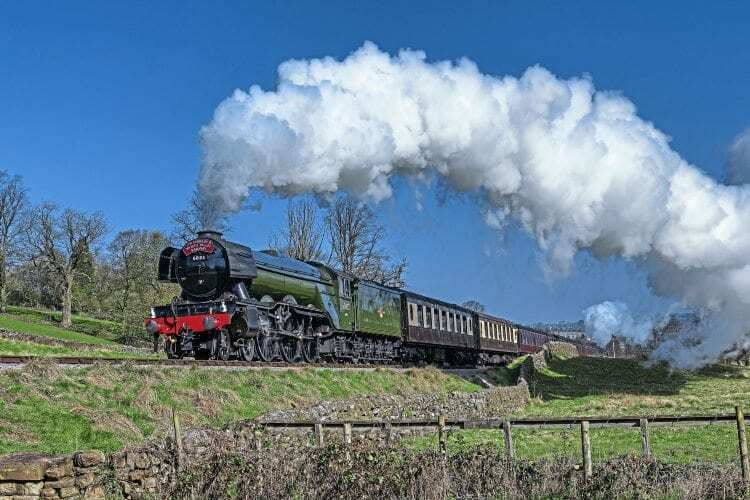 FLYING Scotsman certainly left its mark on the Keighley & Worth Valley Railway during its visit in early April, with the line’s operations officer Richard Jones describing the ‘A3’s’ stay as an “unprecedented success”. The celebrity Pacific arrived on March 29 after weeks of tele-sales and advanced bookings for both its KWVR services and the special Settle & Carlisle reopening train on March 31. The S&C special had in fact sold out well in advance of it running, and ultimately carried more than 550 passengers. To meet demand for No. 60103’s turns over the 4½-mile line, the railway fielded an eight-coach train, including two Pullmans, which had to be top-and-tailed with ‘WD’ 2-8-0 No. 90733; Flying Scotsman was positioned at the Oxenhope end so that it could work chimney first out of Keighley.